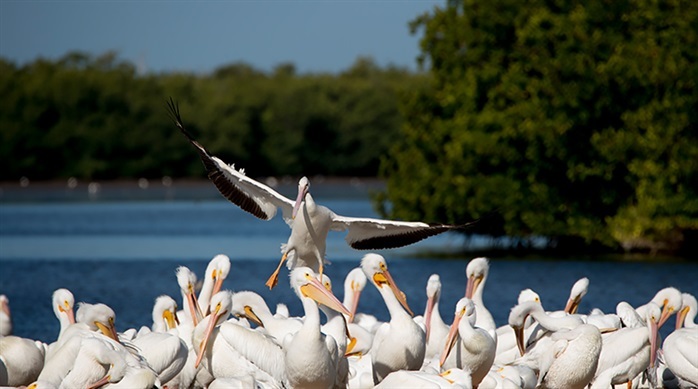 One of the best places for bird watching in the winter is Sanibel Island, accessible by a causeway from Ft. Myers, FL. The J.N. "Ding" Darling National Wildlife Refuge, though only a 4 mile drive, is replete with wintering waterfowl: egrets, herons, cormorants, pelicans, spoonbills, among others. 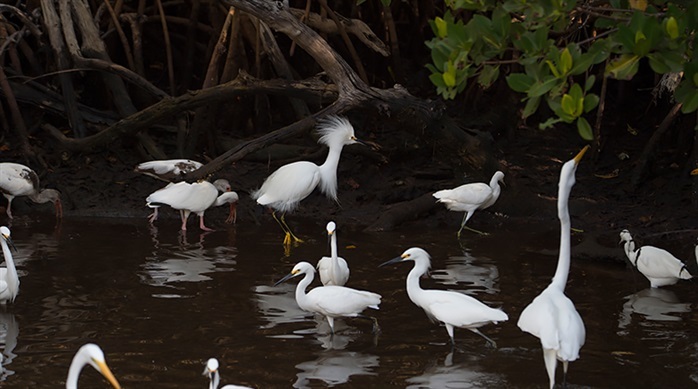 The refuge is part of the largest undeveloped mangrove ecosystem in the United States, according to its website. "Ding" Darling was an early Florida conservationist who helped block the sale of environmentally valuable land to developers on Sanibel. He urged President Harry S. Truman to sign an Executive Order creating the Sanibel National Wildlife Refuge in 1945. It was renamed in 1967 in honor of Darling. 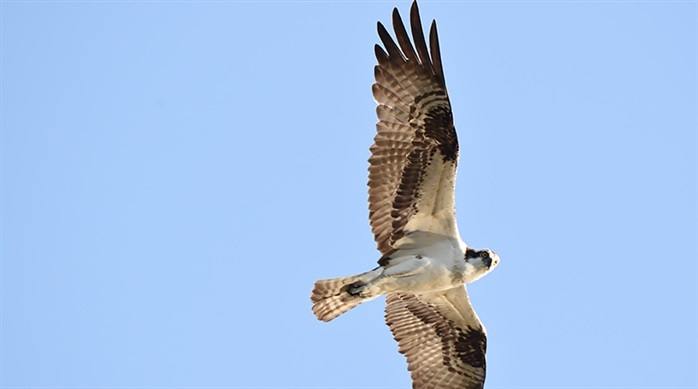 The refuge covers about 6,400 acres with over 245 species of birds found there. Occasionally one is lucky enough to see several species gathering together to fish for the small minnows in the mangroves. Here there are Snowy Egrets, Great White Egret, mature and immature White Ibis. 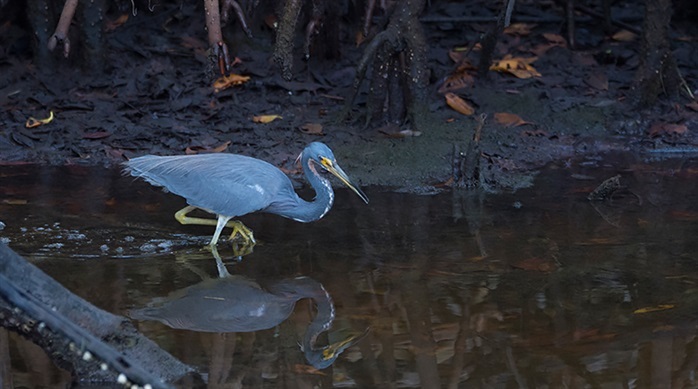 Tri-colored Herons are frequently seen, usually more solitary than the egrets. 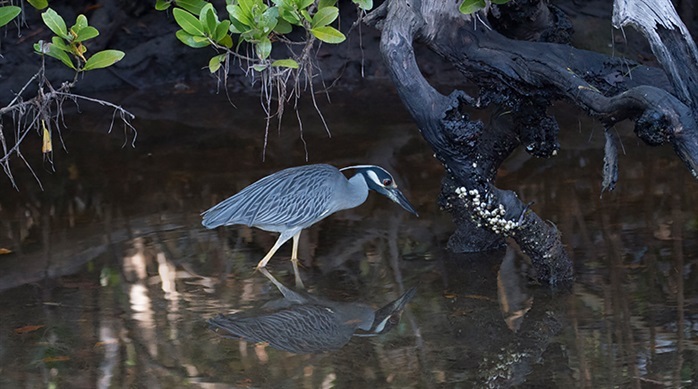 Another loner is the Yellow-Crowned Night Heron, typically seen late in the day. White Pelicans gather to preen and rest. The Brown Pelican is a year-round resident of Florida but the Whites migrate from the North from October to March. Above the fray the Osprey circles, looking for fish, before diving down and catching its prey in its sharp talons and flying to a nearby tree to eat his lunch.